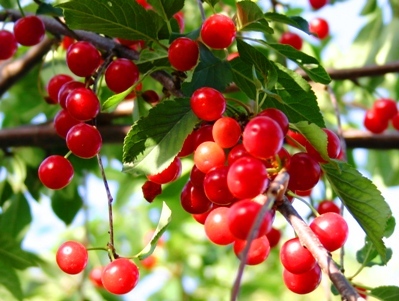 Elisa phones to tell me that the amarene – sour cherries – are ripe and plentiful on her huge tree, and invites me to pick as many as I want. I love sour cherries in jam, dessert sauces and in a crostata, so off I go with a big bucket. Picking amarene is the easy part, albeit sticky. With a slight tug, ripe amarene come easily off the stems into my hands, occasionally squirting a bit of juice into my face. After about an hour of sticky picking I’ve got a half a bucket filled – more than a gallon of beautiful ripe amarene. Somehow I forgot to figure pitting into the jam-making equation. This is the type of job that one traditionally does with a handful of chattering relatives, so that the work goes quickly and you get caught up on all the family gossip. Unfortunately, I am alone today, so pitting, is well, the pits. Though the pits come out easily, juice spatters across the counter and leaves sticky red drops across the kitchen floor. I solve this by holding the cherries down in a pot when pitting, which results in spraying red droplets onto my formerly clean shirt. After an hour and a half of steady pitting, the amarene seem to have multiplied by the thousands. Emanuele shows up and gasps at the alarming red splatters in the kitchen that look like a sloppy murder scene. He graciously decides to help for the last 30 minutes, and wisely changes from white linen into an old red T-shirt. At the end of the pitting session, I freeze a kilo (2 pounds) of whole pitted cherries for future use, while the remaining 4 liters (8 cupfuls) are destined for sour cherry jam. Using a cooking method I adapted from David Lebovitz’s blog, first put a small white plate in the freezer (with a metal tablespoon). Then, put the sour cherries in a pot with 2 TB of fresh lemon juice and cook over high heat until soft about, 20 minutes, stirring with a wooden spoon to make sure they don’t burn. Measure the amount of cooked cherries and jam (being careful not to splatter any hot juice on your skin), and add an equal amount of sugar. Use a deep pot so the jam doesn’t boil over. If you think this is a lot of sugar, let me assure you it’s not. 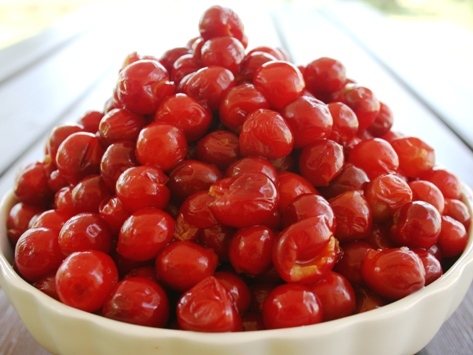 I hate overly sweet jam that doesn’t taste like fruit, but the beauty of amarene cherries is that they are very sour, so you can add lots of sugar and still have a thick jam that is tart and fruity. In fact, equal amounts of sugar and fruit may still be too sour for some sugar lovers, but this is the proportion I generally use when the amarene are perfectly ripe. Ladle the hot amarene jam or dessert sauce into clean canning jars, wipe the rims with a clean wet cloth and seal with a new clean cap. (I use very small jars so that in case I am enticed to give any as a gift there will still be enough for me.) 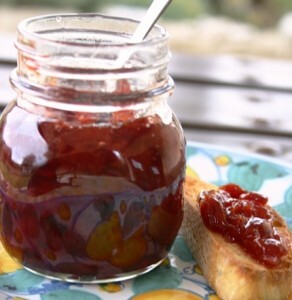 If there is any jam leftover that doesn’t fill a jar, immediately toast a piece of bread and slather it with the warm amarene jam. Revel in the intense cherry flavor-this is the moment when all that arduous pitting was worth it. Amarene jam makes a fabulous crostata, raising this humble Italian dessert to new heights of glory. Here is a recipe for crostata di marmellata di amarene, or sour cherry jam tart. Terrific post—I can literally taste the jam! Sounds like it would be great over ice cream. Yes, the “dessert sauce”, which actually was a result of getting fed up with cooking the jam, is wonderful over ice cream. One can often find a gelato flavor in Italy called amarene, but it is usually too cloying sweet and just not cherryish enough for my taste. I am going to experiment with making a semifreddo and with some of those precious amarene in the freezer. Pingback: Furtaies are funnel cakes of the Dolomites, topped with red bilberry jam, they're the perfect treat after a long hike in the wildflowers. My relatives in italy make a sweet liqueur from amarene, they call the liqueur Ratafina. My relatives come from a small town Lenola, in the province of Latina. Tony- I had not heard of this, but did find a recipe for Ratafià from the region of Lazio, which contains amarene, red wine, cinnamon stick, cloves, and coriander seeds that are mixed together and left to ferment for 40 days, then filtered and mixed with sugar and alcohol, aged for a few more days and then bottled and left for another 40 days before drinking. Sounds delicious and powerful! 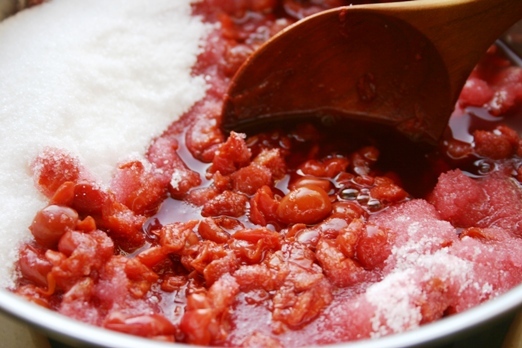 can you use frozen cherries to make the jam? Yes Joan, frozen cherries work very well for jam. Then you can make the jam when you want instead of in the hot summer!